Abstract: Drawing in part on internal Islamic State documents, this article aims to provide a new and more nuanced understanding of how the Islamic State has dealt with Kurds. Though the Islamic State is often characterized as being inherently anti-Kurdish, the organization has recruited Kurds and directed messaging toward Kurdish audiences. At the same time, internal documents in particular show the tensions between realities on the ground for Kurdish communities that lived under Islamic State control and the organization's ideology that is, in theory, blind to ethnicity. This article seeks to provide a more nuanced understanding between the narrative of Islamic State persecution of Kurds simply for being Kurdish and the theoretical ideal of no discrimination among Muslims on the basis of ethnicity. This subject will be explored primarily through internal Islamic State documents, though some of the organization's external propaganda will be taken into account as well. As part of the investigation, this article will particularly focus on Islamic State recruitment of Kurds and the policies toward Kurdish communities and Kurds living in its areas. Given these precedents, it should not be surprising that the Islamic State would recruit Kurds who are ideologically committed to its cause. In this regard, there have been multiple propaganda items from the Islamic State featuring Kurds in the organization's ranks. Prior to the caliphate announcement, one such item was the 26th video in the series "A Window Upon the Land of Epic Battles," released in November 2013 by what was then the Islamic State in Iraq and al-Sham's al-Itisam media. The video, entitled "A Message to the Kurds and a Martyrdom Operation," features a Kurdish speaker threatening the Kurdistan Regional Government in Iraq, vowing that "by God's permission, we will return to Kurdistan with the arms we have placed on our shoulders. "8The speaker continues, "By God's permission we will defeat you just as we have defeated the apostates of the PKK and the shabiha of Bashar...despite the force of their arms and their large numbers. "9 The speaker is thus making a clear distinction between fighting Kurds merely for being Kurdish and fighting Kurdish political entities that are deemed apostate (i.e., Muslim by origin but having left the fold of Islam) for espousing a heretical, nationalistic outlook. Thus, so far as recruitment is concerned, the evidence is clear that the Islamic State willingly accepts fighters and members of Kurdish origin. The criterion of acceptance that matters here is the ideological commitment to the Islamic State. While the Islamic State has no problem in recruiting Kurds willing to serve and fight for the organization, most people in the various cities, towns, and villages that have fallen under Islamic State control do not become members of the Islamic State. Rather, they remain as civilians. Many of these civilians might have ended up working in various administrative offices and aspects of governance co-opted by the Islamic State (e.g., teachers in schools), but that does not mean that they became members of the Islamic State. Kurdish communities and populations are known to have existed in many areas that were seized by the Islamic State, including villages in north and east Aleppo countryside, the cities of Raqqa and Tabqa along the Euphrates in central northern Syria, and the city of Mosul. According to Islamic State maxims, the theory is that the group should deal with these Kurdish communities solely on the basis of their religion. If they are Muslims who outwardly follow the rules and rituals of Islam, then there is no reason to treat them any differently than Sunni Arabs abiding by the dictates of the religion and living under Islamic State control. 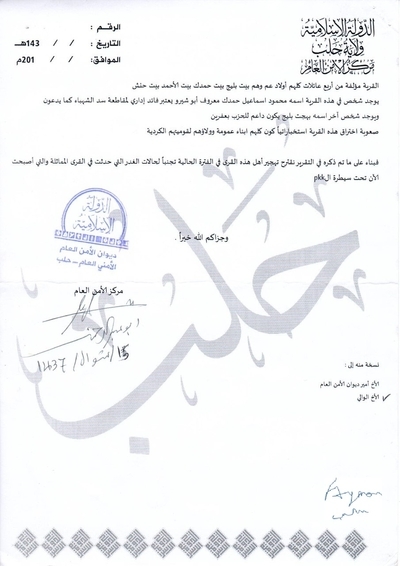 The principle is well illustrated in a statement distributed by the Islamic State's Ninawa province media office in Mosul in late July 2014, denying the rumors of forcible displacement of Kurds from the province. The statement affirms, "The Sunni Kurds are our brothers in God. What is for them is for us, and what is upon them is upon us. And we will not allow any one of them to be harmed so long as they remain on the principle of Islam. "15 In practice, however, the widespread suspicions and associations of Kurdish communities with Kurdish nationalist parties have led to discriminatory treatment in many areas under Islamic State control. The evidence for discriminatory treatment of Kurdish communities primarily comes from internal documents from Syria. 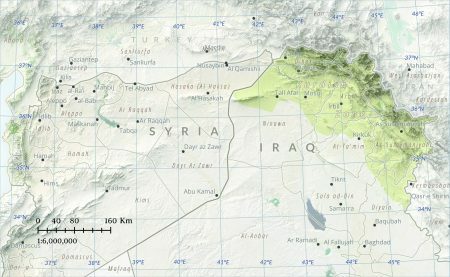 Close cooperation between the U.S.-led coalition and the Syrian Democratic Forces (SDF), which includes the Syrian offshoot of the Kurdistan Workers' Party (PKK)—the Democratic Union Party and its armed wing the Popular Protection Units (YPG)—has been vital in pushing back the Islamic State in the north and northeast of the country. In June 2015, the Islamic State issued a notification in Raqqa province requiring Kurdish inhabitants to leave for the Palmyra area in Homs province.16 The decision was justified on the grounds of the "alliance of the Kurdish parties" with the U.S.-led coalition and that there were some among the Kurdish inhabitants under the Islamic State who had "cooperated with the Crusader alliance." Thus, on the grounds of alleviating tension, the stipulation to leave Raqqa province was imposed. At the same time, the Islamic State was careful to emphasize that the properties of those Kurds required to leave but considered to be Muslims would not be confiscated, and the group made arrangements for their property to be registered with the real estate bureaucracy. 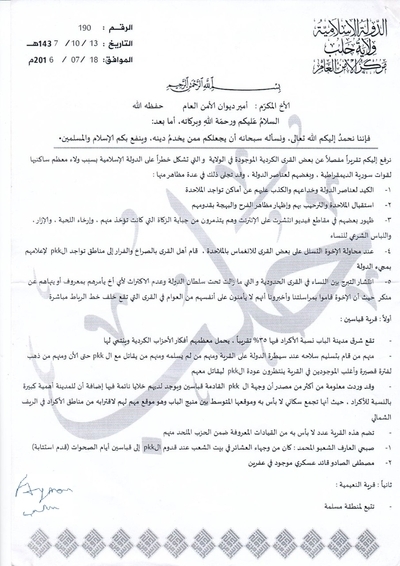 A subsequent statement was issued by the emir of Raqqa city, warning Islamic State fighters that they could not infringe on those properties.17 This prohibition was reaffirmed the following month,18suggesting that violations had taken place. It is not clear, in the end, how far these stipulations against seizing Kurdish properties were enforced. The documentary evidence suggests that not all Kurds who were living in Raqqa province under the Islamic State ultimately left these areas. It appears that it subsequently became possible to obtain an exception to the requirement to leave. From the Raqqa province city of Tabqa, a document dated December 2015 emerged from the ruins of the aftermath of the Islamic State's defeat there by the U.S.-backed SDF. 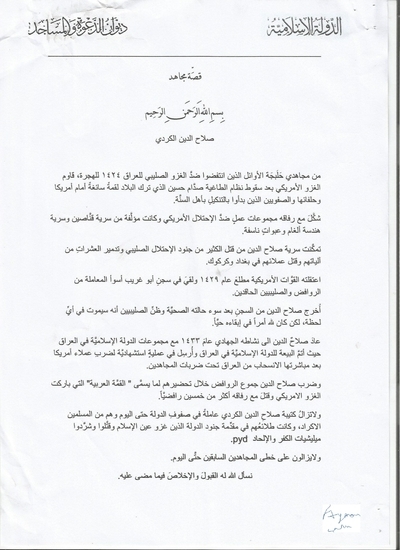 The document noted that those Kurds who still wished to reside in Raqqa province had to go to the office of Kurdish affairs.19 Many Kurds, of course, would have fled Islamic State territory entirely, and the Delegated Committee (a general governing body for the Islamic State) issued a directive in mid-August/mid-September 2015 requiring confiscation of property of Kurds who fled to "the land of kufr" (land governed by those deemed to be non-Muslims).20 It should be noted, however, that confiscation of property of those who fled the Islamic State was not unique to the Kurds and other ethnic minorities. A similar fate befell the properties of medical professionals who fled the Islamic State,21 as well as those accused of working with other factions opposed to the Islamic State like the Free Syrian Army. The al-Bab report proceeds to give some specific cases, such as the village of Qibat al-Shih to the north of al-Bab town. According to the report, 99% of the village is Kurdish, with 70% having been with "the atheist party" (presumably referring to the Democratic Union Party/PKK). The Islamic State, the report claims, "killed many of the sons of this village for their loyalty to their Kurdish nationalism, as in the battle of Ayn al-Islam [Kobani], they were going to Turkey and from there to Ayn al-Islam to fight with the PKK." In another case, about a village called Haymar Labadah on the route between Manbij and al-Khafsa with a population of 5,000, the report claims that "the majority of them are from those who hate the Islamic State." More specifically, the report alleges, for example, that by night the people of the village attacked the Hisba [Islamic morality enforcement] base in the village 10 days after it had been opened, stealing 50,000 Syrian pounds ($90-100), a laptop, and some confiscated cigarettes. Moreover, the report says that there are people from the village who have been participating in the SDF campaign to capture Manbij. On the basis of the various cases presented, the report concludes with the suggestion to "displace the people of these villages in the present time to avoid the cases of treachery that happened in the similar villages that have now fallen under the control of the PKK." [a] As a source for information, the series needs to be treated with a degree of caution. The stories related are designed to boost the morale of Islamic State fighters, and as such they are open to considerable embellishment and perhaps even total fabrication. 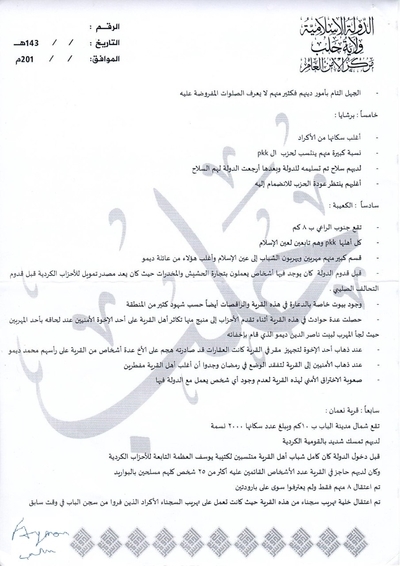 [b] These documents were obtained through an intermediary via the Syrian rebel group Ahrar al-Sharqiya, which is based in the north Aleppo countryside. Its members, who originate in the eastern Deir ez-Zor province, participated in battles against the Islamic State in Aleppo province and have taken Islamic State members as prisoners. In addition, they continue to maintain connections with contacts in eastern Syria and thus, have multiple avenues for obtaining Islamic State documents. The study obtained reflects a typical function of the Islamic State's security department in the provinces—that is, to investigate anything that may be considered a security threat to the Islamic State. Burak Kadercan, "This is what ISIS' Rise Means for the 'Kurdish Question,'" National Interest, September 9, 2015. Thomas Hale, "A short history of the Kurds," Financial Times, October 17, 2014. Ranj Alaaldin, "The ISIS campaign against Iraq's Shia Muslims is not politics. It's genocide," Guardian, January 5, 2017. Abu Muhammad al-Adnani, "This is the promise of God," Al-Furqan Media, June 29, 2014. Aymenn Jawad al-Tamimi, "A Complete History of Jama'at Ansar al-Islam," aymennjawad.org, December 15, 2015. Brian Fishman, "The Man Who Could Have Stopped The Islamic State," Foreign Policy, November 23, 2016. "Al-Itisam Media presents a new video message from the Islamic State of Iraq and al-Sham: 'A Window Upon the Land of Epic Battles #26,'" Jihadology, November 15, 2013. "New video message from the Islamic State: 'The Kurds: Between Monotheism and Atheism, Wilayat al-Raqqah,'" Jihadology, August 2, 2016. For example, "Who is leading the Da'esh forces on the right side in Mosul...and why?" Qoraish, January 19, 2017. Story of Salah al-Din al-Kurdi, Qisas al-Mujahideen (see Exhibit 1). This was obtained by the author (via an intermediary) from an individual who worked in the Islamic State administration in Manbij and left for the Azaz area in the north Aleppo countryside. Metin Guran, "The Ankara Bombings and the Islamic State's Turkey Strategy," CTC Sentinel 8:10 (2015). Specimen 8Y in Aymenn Jawad al-Tamimi, "Archive of Islamic State Administrative Documents," aymennjawad.org, January 27, 2015. This archive of Islamic State administrative documents is housed on the author's website and reflects an ongoing project that began in January 2015 to collect and translate Islamic State documents, which total more than 1,000 in number. This archive includes gathering of documents available in the open-source realm and documents collected privately from contacts, with determinations made as to their authenticity based on a number of criteria (e.g., use of stamps, absence of red flag motifs. etc.). Specimen 5M in "Archive of Islamic State Administrative Documents." Specimen 6B in "Archive of Islamic State Administrative Documents." Specimen 9Z in "Archive of Islamic State Administrative Documents." Specimen 37R in Aymenn Jawad Al-Tamimi, "Archive of Islamic State Administrative Documents (continued ... again)," aymennjawad.org, September 17, 2016. 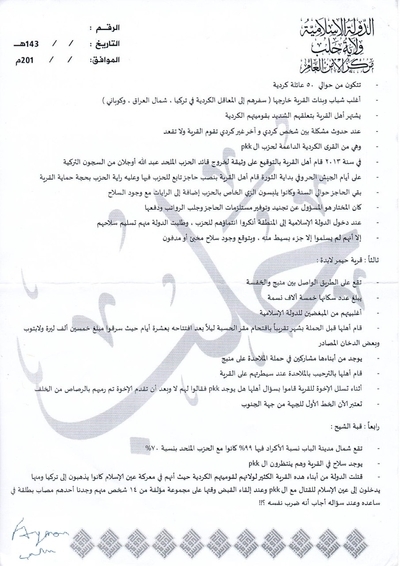 Specimen 25J in "Archive of Islamic State Administrative Documents (continued ... again)." Specimen 5I in "Archive of Islamic State Administrative Documents." For example, Wladimir Van Wilgenburg, "Syrian Arabs around Manbij overjoyed IS vanquished, welcome SDF, Kurds," Middle East Eye, June 12, 2016. Aymenn al-Tamimi, "#Syria: Shami Front and Ahrar al-Sham visit Kurdish village of Susenbat in north Aleppo countryside: outreach to Kurdish tribal figures," Twitter, May 1, 2017. Author interview, Ahmad Masto, anti-PKK Kurdish activist in Syria, September 2017.